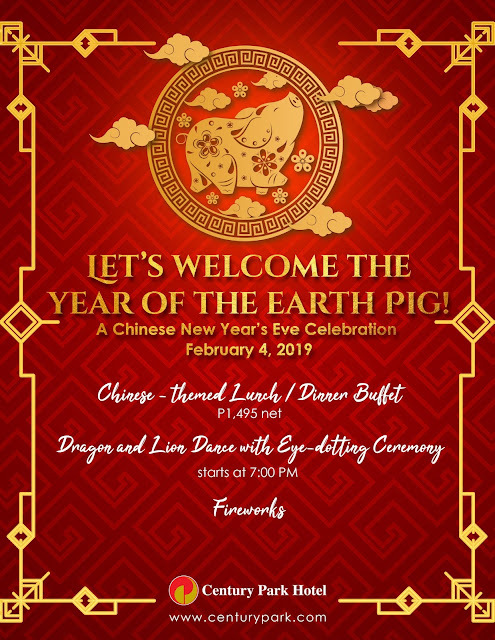 One of the most auspicious celebrations in the world is about happen tonight as the clock ticks and welcome the Year of the Earth Pig. 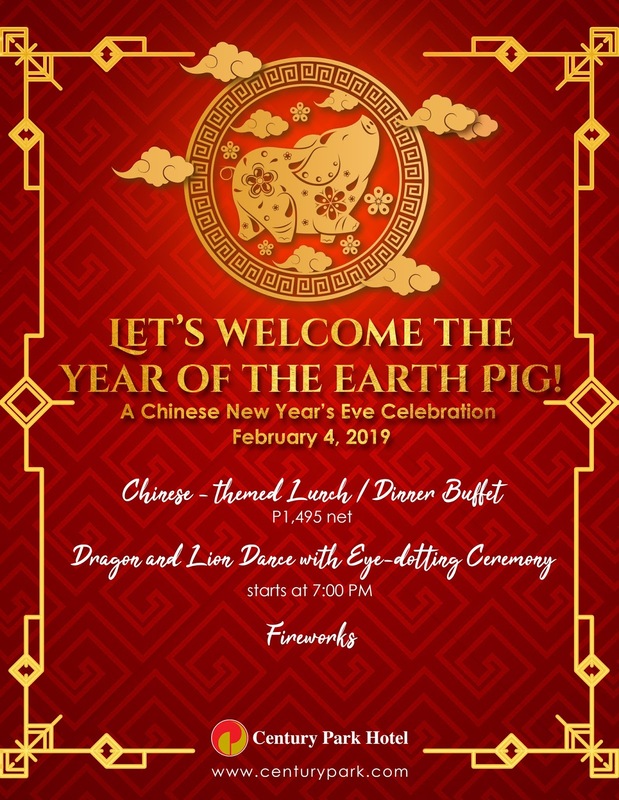 And Century Park Hotel (CPH), one of the finest hotels in Manila, is set to celebrate the upcoming Chinese New Year with festivity fit for everyone! Starting today, sumptuous Chinese dishes will be showcased at the lunch and dinner buffet for only Php1,495.00 (net) at Café in the Park for guests craving for Chinese cuisine. By 7:00 p.m., an eye-dotting blessing ceremony will take place before the lion’s first dance at the Atrium Lounge. The ritual will empower the lion to bring about protection, good luck, health, and prosperity to the attendees. The “eyes” of the lion reflect the spirit so the last step before it comes alive is for its eyes to be dotted. A lion and dragon dance follows right after to chase away evil spirits and welcome the new year. This performance will be accompanied with loud drums and cymbals. A grand fireworks display will cap off the momentous occasion. “We look forward to having all of you at the hotel and share this evening with us,” said Anthony Tan, CPH’s General Manager. “May the Year of the Pig bring prosperity and good health to everyone,” he further added. For booking and further details, you may visit Century Park Hotel's official website www.centurypark.com or contact information@centurypark.com.ph and telephone number: (632) 528-8888.